Roulette is a simple and fun game to play at a casino party. Roulette, meaning "small wheel", consists of a wheel, a ball and a table marked with separate boxes containing numbers in non sequential order. You can place bets on any particular number or a set of numbers. Once you have placed your bet(s), the dealer spins the wheel and initiates play and the ball is released in the opposite direction of the spinning wheel. When the ball stops in one of the numbers, you win if your bet was placed on that number. Roulette has both a single zero ("0") and a double zero ("00") while European Roulette only has a single zero ("0"). To start playing Roulette, first you need to place a bet. The chip values in Roulette are normally $1, $5, $25, and $100. You can select any combination of chips to bet from $1 up to $500 up to the table limit. Once you have placed your bet(s) the dealer will spin the ball in the Roulette wheel. The number or color you have placed a bet on does not correspond with the number or color the ball lands on. Roulette consists of a wheel of 38 stops and a ball that can land with equal chance on any of the 38 stops. The stops are numbered in non-sequential order "0", "00", and then 1-36. The stops 1-36 are colored either black or red and the "0" and "00" stops are colored green. You can make wagers on where the ball will land on the wheel by placing chips on the Roulette table. Winnings are paid on a multiplier of the bet. Just place your chips on your chosen number. You may wager on any number including zero (0) and double (00). Just place your chips on the line separating any two given numbers. This allows you to bet both of the two numbers at the same time with one chip. Just place your bet on the outer right boundary line of the roulette table. This allows you to bet on the row of three corresponding numbers. Just place your chips on the cross where four numbers intersect. This allows you to bet on any of the four corresponding numbers. Just place your chips on the outer right line of the roulette table between "00" and "3." This allows you to bet on any of the following numbers "0," "00," "1," "2," and "3." Just place your bet in one of the three boxes marked "1st 12," "2nd 12," or "3rd 12." 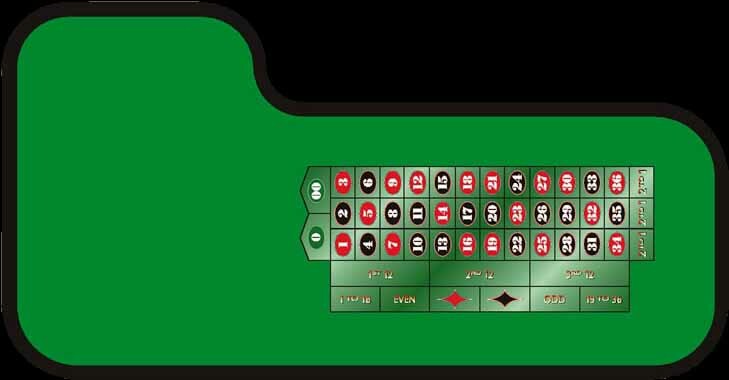 Just place your chips on the outer right boundary line of the roulette table where it is intersected by the line dividing two rows. This allows you to cover two street bets. Just place your bet in one of the three boxes marked "2 to 1." This allows you to bet on any of the twelve numbers in the column above it. Just place your bet on either red or black, and it the ball lands on your color you win. Just place your wager on either odd or even and if the ball lands on your choice, you win. Look here to find the minimum and maximum total of the outside bets allowed. Outside bets are the large groupings of numbers along the "outside" of the roulette table. These bets include 1st 12, 2nd 12, 3rd 12, 1-18, 19-36, Even, Odd, All Reds (the red diamond), All Blacks (the black diamond), and the 12-number columns at the end of the table.